Did you know the latest version of Photofile includes support for Airplay ? it does ! AirPlay makes it amazingly easy to have your pictures appear on your TV. With Photofile you can both AirPlay images in your collection or actually AirPlay the images on a webpage without even downloading them. It’s a really fun way to browse through image websites. 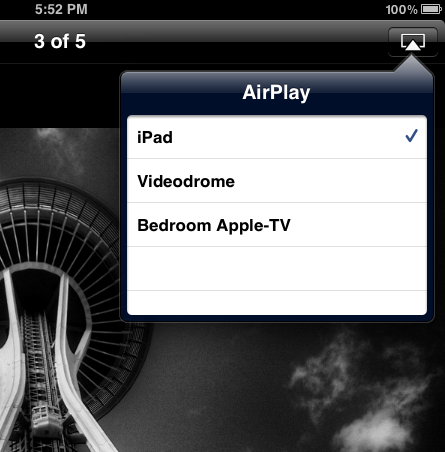 To use AirPlay you will need an AppleTV or some other device that support video over airplay. 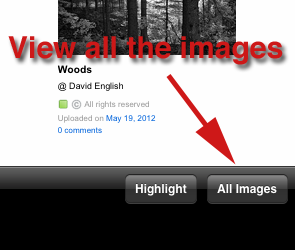 2) Next click “All Images” to view just the images on the page. 3) Once the images are done being loaded, click an image to load it up full. 4) With an image displayed click the Airplay icon in the upper right. 5) Select your AirPlay device and the currently visible image will show up on the tv. 6) Now just hit the Play button and all the images on the page will Play through your TV ! Let us know how you like using this feature and any other features that would help make Photofile the BEST way to bulk download and view internet images. Photofile is now a universal app ! Photofile 1.0.2 is out today ! Photofile FREE 1.0.1 Released !